Heat oven to 375°F. Remove giblets from chicken; discard. Rinse chicken inside and out with cold water; drain. Pat dry with paper towels. Grate 1 teaspoon peel from lemon; set aside. Cut lemon into slices. In small bowl, combine garlic salt, thyme, chili powder, ground red pepper and lemon peel; mix well. Place lemon slices and onion quarters inside chicken. Loosely tie legs together. Place chicken, breast side up, in shallow roasting pan. Rub outside of chicken with margarine; sprinkle with thyme mixture. Bake at 375°F. 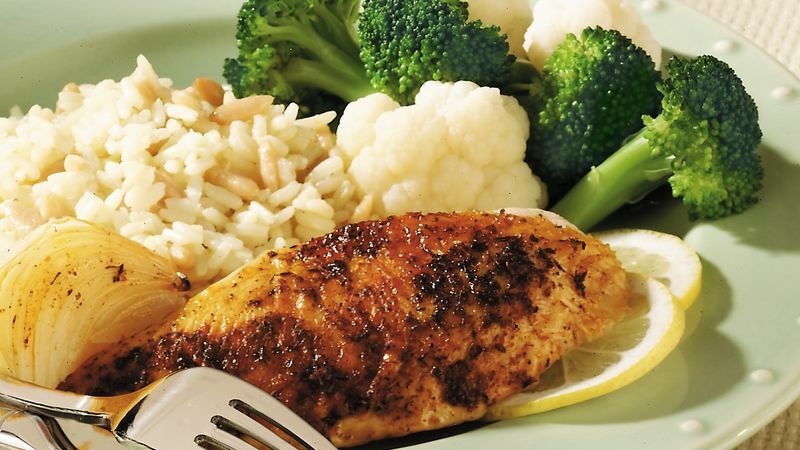 for 1 1/2 to 2 hours or until chicken is fork-tender and juices run clear, basting chicken with pan juices every 30 minutes. Outside of chicken will be dark golden brown. Cover with foil; let stand 10 minutes before serving. Discard lemon slices. If desired, serve onion with chicken.